Last night, I updated my Nexus 7 to Android 4.2. After not turning on my device for some time before the OTA, I was met with lots of app updates in Google Play. Unfortunately, it looks there’s an issue between Google Play and Android 4.2 on the Nexus 7, as one of Kellex’s tablets is also having a similar issue. 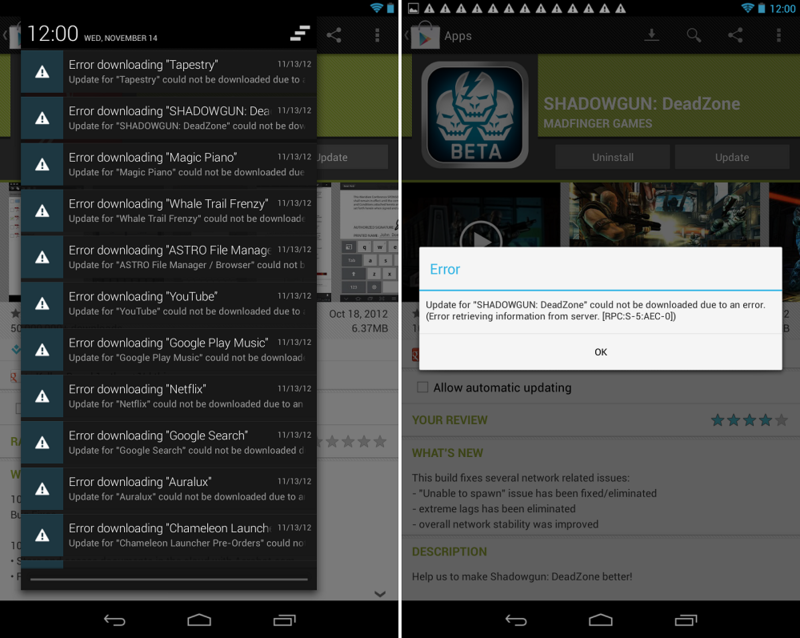 We’ve tried wiping data and force stopping Google Play, but nothing has worked yet. While we’re on the lookout for a fix, have any of you had this issue as well? If you have and know of a fix, please let us all know down below. Simply remove the Google account, reboot, and then re-enter your Google account. Takes a couple of minutes, but fixes the issue instantly.